As the book title implies, Rhinoceros Surfacing Techniques is mainly about NURBS (Non Uniform Rational B-spline) Surfacing Techniques pertaining to Rhino 3D or Rhinoceros, the versatile 3D Modelling and CAD program. Inside Rhinoceros are powerful tools for the creation of accurate and smooth surface models. To be able to utilise this book effectively, the Reader should have a basic working knowledge of the Rhinoceros 3D CAD software version 5 or 6. 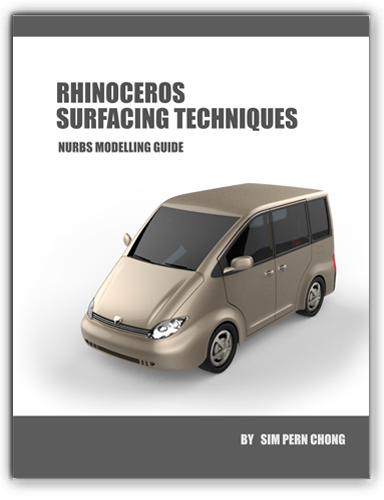 RHINOCEROS SURFACING TECHNIQUES BOOK covers the underlying principles essential for successful and efficient surface modelling. The first part deals with strategies and modelling tool. The subsequent portion cover different surfacing techniques. Some of the surfacing techniques have an accompanying video that demonstrates the process. The last portion covers the important aspect of downstreaming and how the eventual CAD file can be exported properly for manufacturing, 3D printing or rapid prototyping. Rhinoceros Surfacing Technique is available on Amazon Marketplace. >> Click here for details on Rhino Surfacing Technique Book.